Brief Synopsis – A nurse is traumatized by a home invasion and must find a way to forgive her attacker and move on with her life. My Take on it – This is another film that I knew nothing about before seeking out other films starring Rosamund Pike. The premise itself made it seem interesting enough to check out. I loved how it takes things to unexpected places which works to help make this film even more enjoyable. They present things in quite a unique fashion and allows the viewer to get a very interesting perspective on this kind of story which seems on the surface to be a typical film of this genre. 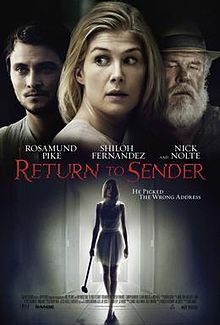 Rosamund Pike is great in the lead role here and she is able to give us a feeling that her character is quite real and her actions genuine. It’s so easy to completely understand everything that her character does along the way. Nick Nolte is also great in a supporting role that allows us to see him in a great dramatic supporting role that is quite different from the gruff characters he is known for over his career. Bottom Line – Very interesting premise that goes places that are quite unexpected which helps make this film even more enjoyable. The way things are presented is done quite uniquely and it gives the viewer a very interesting perspective on this kind of story. Pike is great in the lead and we really get a feeling that her character is quite genuine in everything she says and does along the way. Nolte is fine in a supporting role that allows moviegoers to see another side of him after so many years of playing tough characters. Recommended!